Lost Your Car Key? stolen? Need a spare key? Losing or misplacing your car keys may feel as if the worse thing has happened. You may have forgotten it while you were out dining or it could of simply fell of your key chain. It is unfortunate that these scenarios always occur when you least expect it. Late at night at an unfamiliar location or during the day when you are working and in a hurry to an important meeting. At Valrico Locksmith, we understand these type of circumstances and are always readily available to respond day or night and get you of a bond. 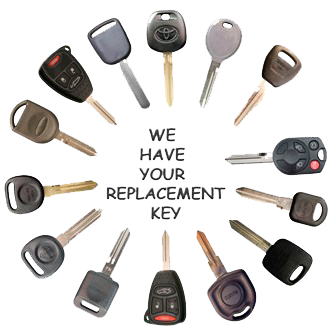 We offer 24 hour car key replacement. Wherever you are, whenever, we have mobile automotive locksmith trucks equipped with the state of the art technology, Transponder car keys, Remotes and ignitions. So, when you lose your car key DO NOT rush to call a towing service and seek for help from the dealer! Valrico Locksmith is able to provide you with a new set of car keys for a fraction of the cost.